Mason Jars are one of the most versatile household items and can be used in a variety of innovative ways. Right from being used to store things or as decorative items, mason jars can take on a number of forms, depending on what you do with them. 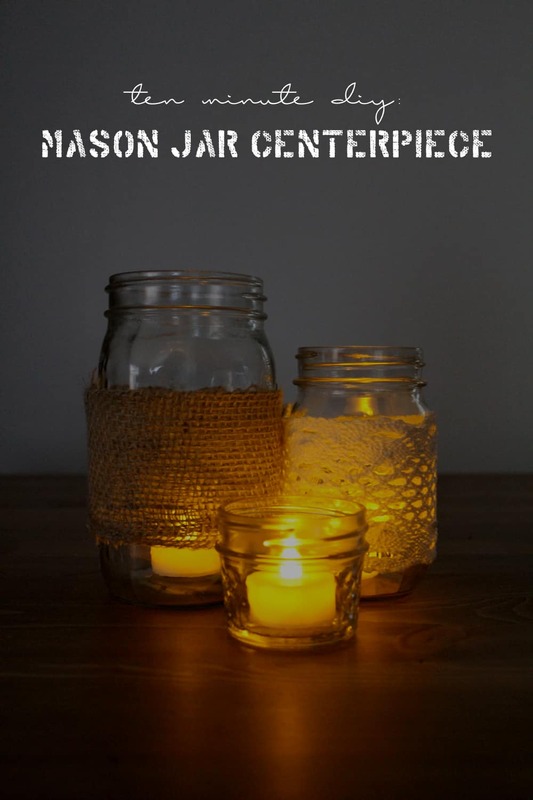 The DIY potential is limitless with mason jars, and one popular DIY that can be done with this versatile household item in DIY mason jar lights. Because of their shape and structure, mason jars form great holders for lights and can be customized in a number of ways to look good. 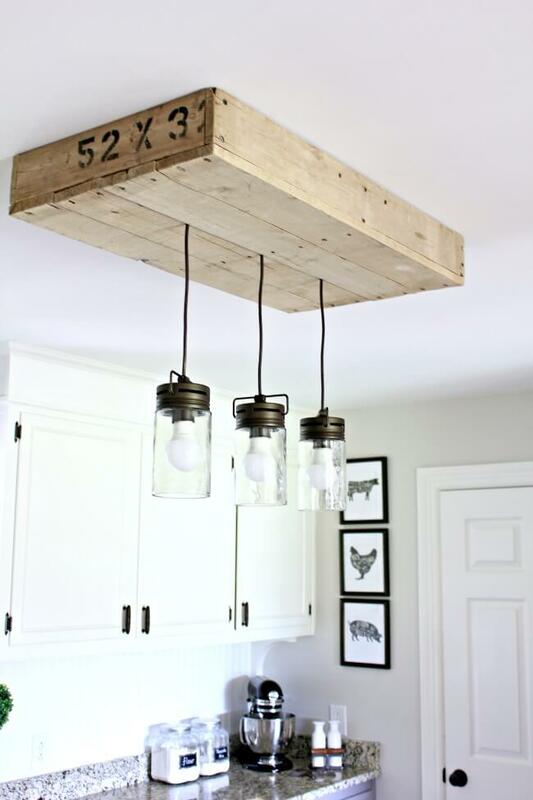 When it comes to DIY mason jar lights, there is a lot of scope for ones own customization. Since this is something that you do yourself, you can make it look however you want it to. The DIY mason jar lights that you make are unique to you, which can add their brilliant flair to what you have made. 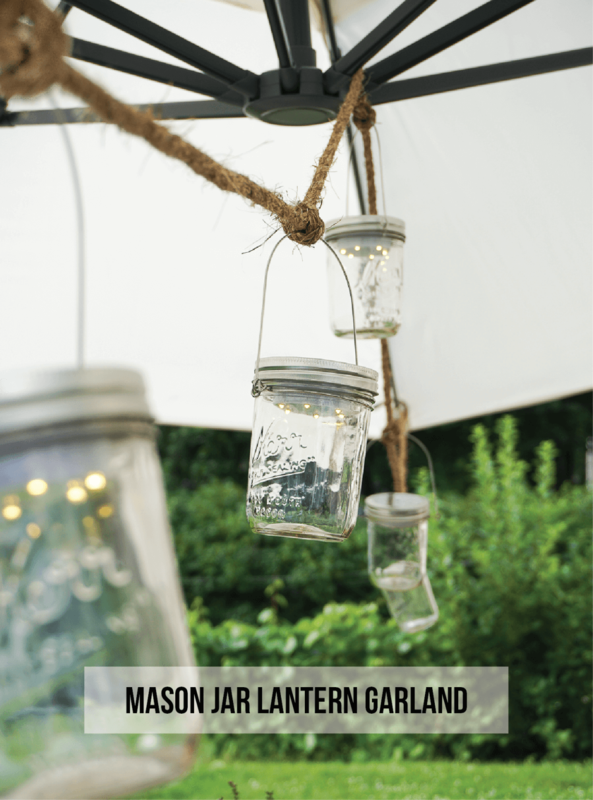 If you have a few spare mason jars at home or are thinking of what you can do with them, we are here to give you some inspiration in the form of fifteen DIY mason jar lights that you can make at home. Mason Jars are incredibly easy to paint on and can make for great candle holders. The paint will give the light emitted from the candle a soft glow, which is why it is essential to choose a color that you like the most! This set of mason jars has a leaf in the center, but you can paint around any image that you want. Mason jars are great when trying to bring some light onto your table, and can serve as pretty yet simple table lamps. 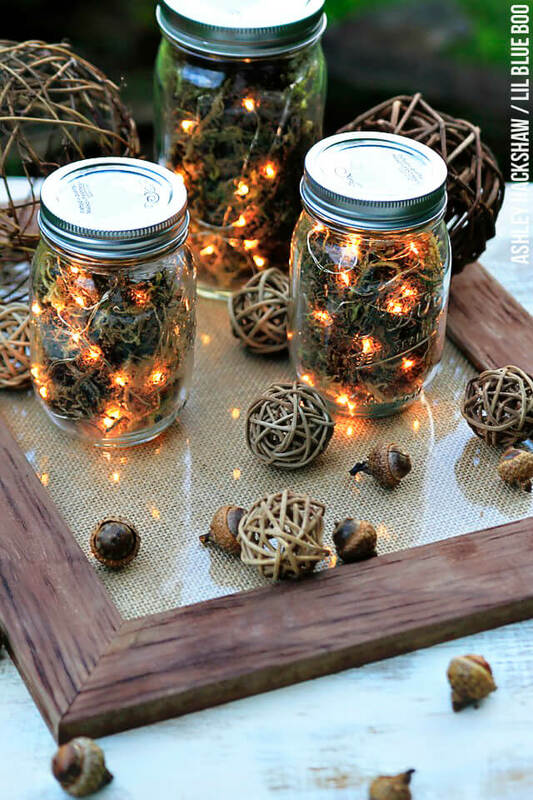 This particular one uses twine or wire along with string lights to give the mason jar a nice and warm woodland feeling. The mix of brown and yellow hues in this light gives it a comforting aura, making it a perfect addition to your work desk. Mason Jars don’t only need to be used as desk lamps, and can sometimes even be used as sidewall lamps. This particular mason jar is filled with rocks halfway and uses a small candle to illuminate your home. The holder elegantly holds the mason jar in position and can make it easier for you to remove and light it up. Mason Jars can make for an exciting piece of decor when put together creatively. 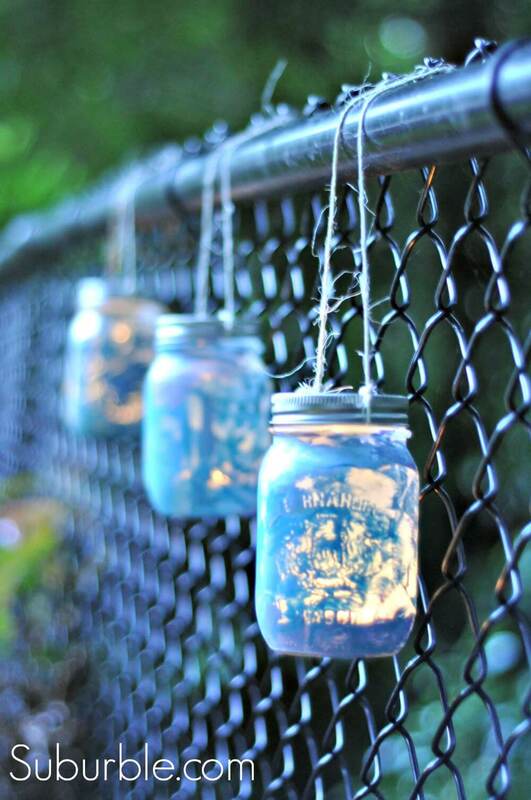 This particular piece uses three mason jars to cover three individual bulbs. 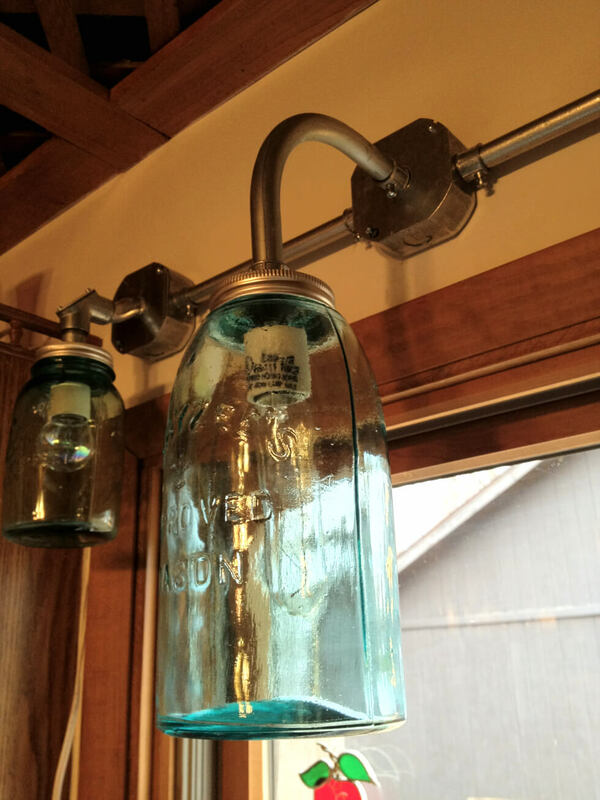 This helps cover up the bulbs while giving your piece a nouveau industrial look. 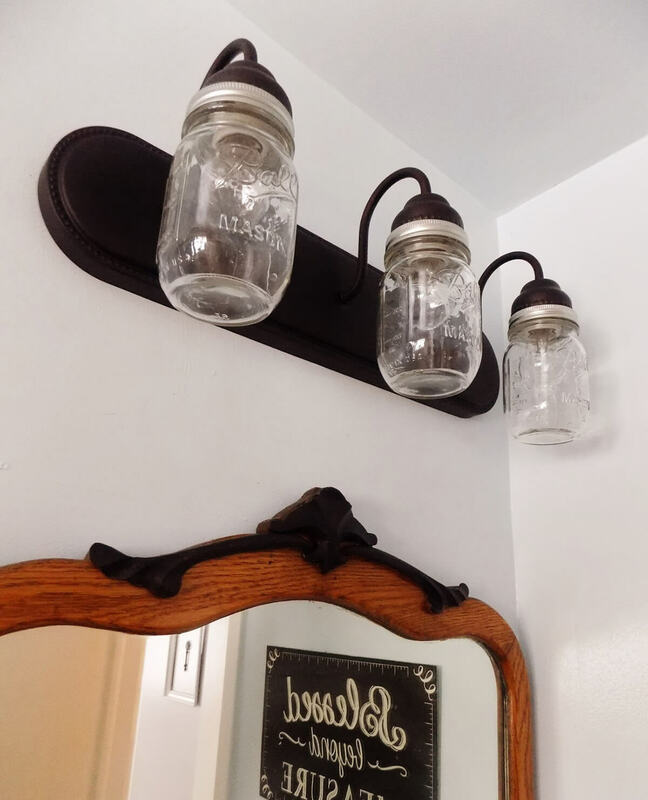 These kinds of DIY mason jar lights make for great overhead lights and can be great for dressers and bathroom lighting. 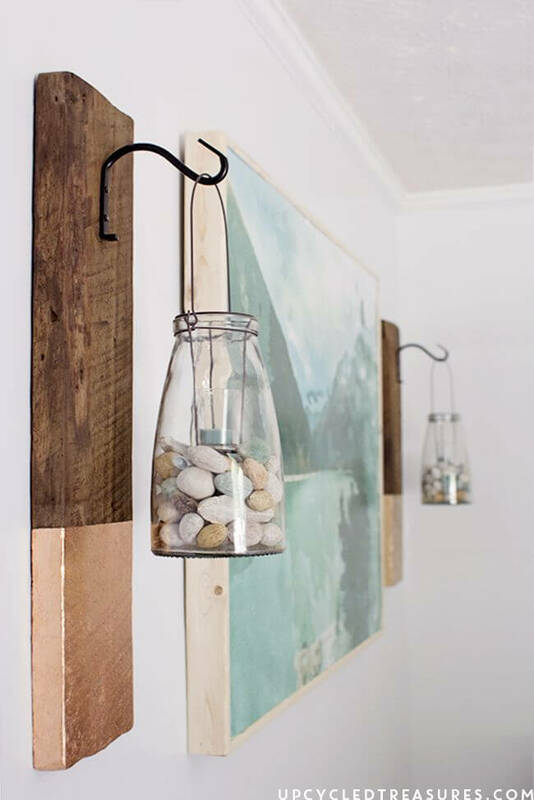 Sometimes, something as simple as two mason jars hanging elegantly against a wooden panel can take your wall up a notch and make it look like the center of attention. This particular design uses smaller pebbles at the base of the mason jar and a colored candle on top. The jar is placed against a panel that is darker in color to bring out the jar and the candle inside it. 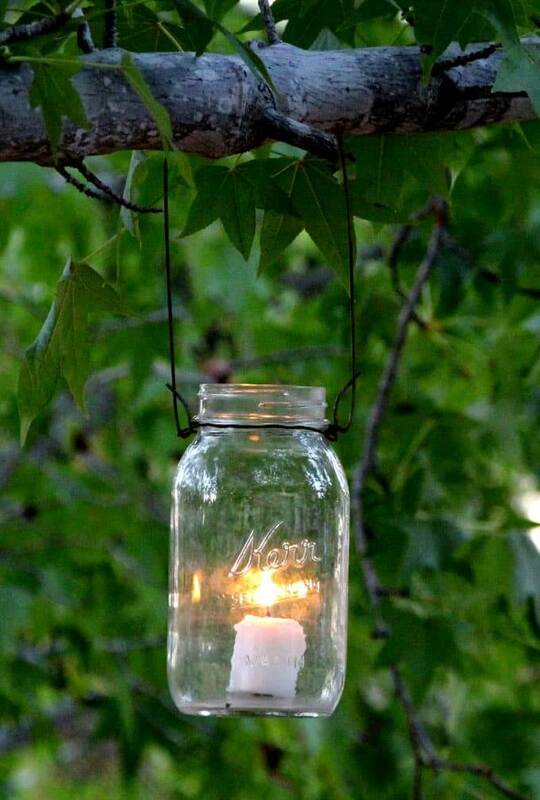 Your backyard can easily be transformed into a fairy wonderland with just a few mason jar candles hanging from the branches of your trees. The mason jars don’t need much customization since the light inside them is beautiful enough to bring out your backyard and make it look beautiful. You can do a small amount of customization to the lamp if you like, but try to keep it minimal since it can take away from the light that is emitted. If you are someone who likes making their candles at home, these are the DIY mason jar lights that you need. 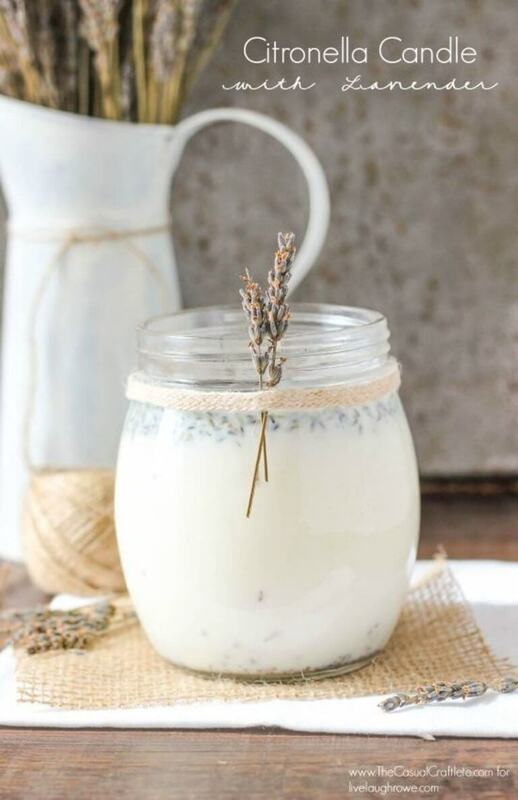 Even though this one is a citronella candle, you can use whatever essence you like to make it smell according to your favorite scent. These candles are great to keep in your bathroom when you want some luxury home spa time, or in your bedroom when you want to relax. If you want a good ceiling piece that you can put either in your kitchen or dining room, this particular one is the perfect DIY that you can try out. The hanging lamps with the wooden board give this entire set a fascinating modern contemporary look with a hint of industrial accents. It forms an interesting lighting source and is something that will certainly grab a lot of attention. If you are wondering how you can incorporate a mason jar light on your table in your home, this is one of the best ways to do it. 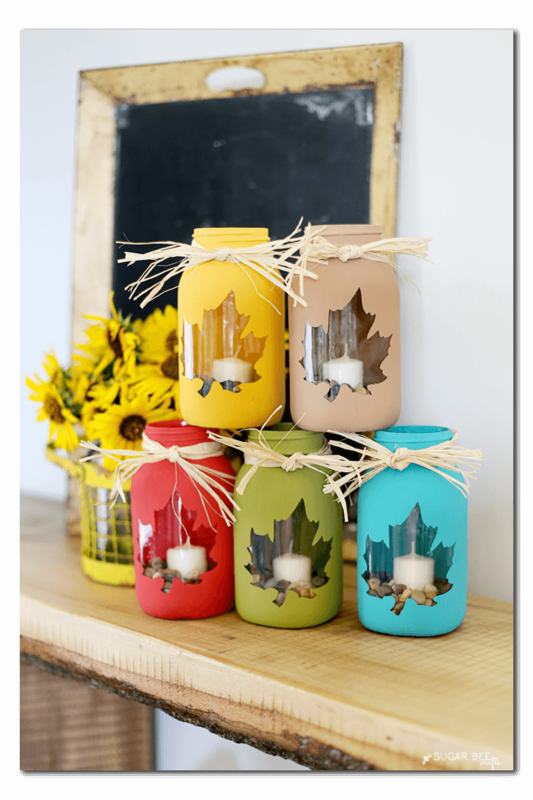 These mason jars are wrapped with some kind of knitted fabric and twine and have a small tea light inside them. Because of the outer fabric, the centerpiece gives off a soft and beautiful glow. If you have a lamp at home that is in need of a good base or stand, you can use a mason jar that is slightly longer to prop it up. 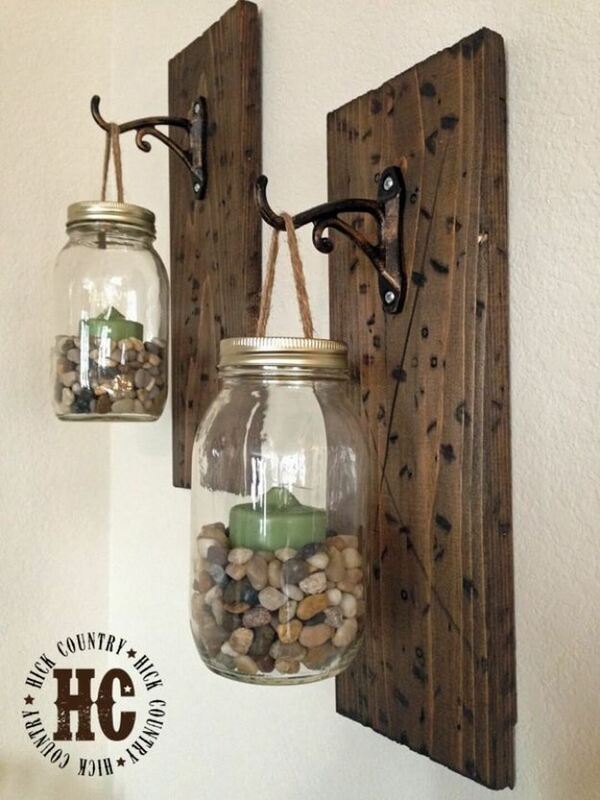 The mason jar also has a few logs inside it to give off that earthy woodland feel, but you can put anything that you think would look good into it. Glitter Lamps are a great way to bring in some color while illuminating the area at the same time. 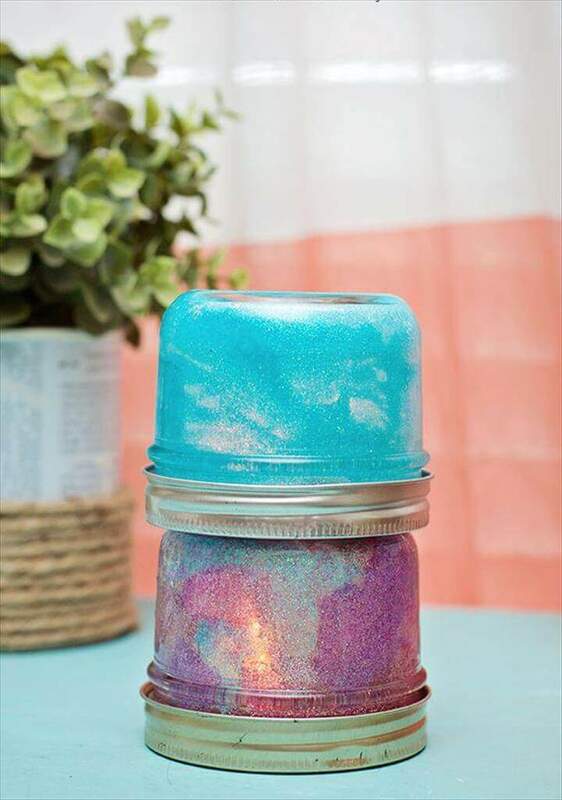 Painting these mini mason jars with glitter paint is incredibly simple, and can even be a good art project to start out for the kids. You can change up the color to whatever you like, or even switch it up with metallic finish paints instead of glitter paints to make it look nice. Having lights on your fence is a great way to illuminate your backyard and make it look nicer. These mason jar lamps have been painted with base paint and then topped off with a metallic touch to make it look even nicer. The metallic paint pops out more when the lamp is lit inside it and can bring out the entire piece. Mason Jars are great to protect your lights from any water damage and can extend the lifespan of your views when appropriately covered. 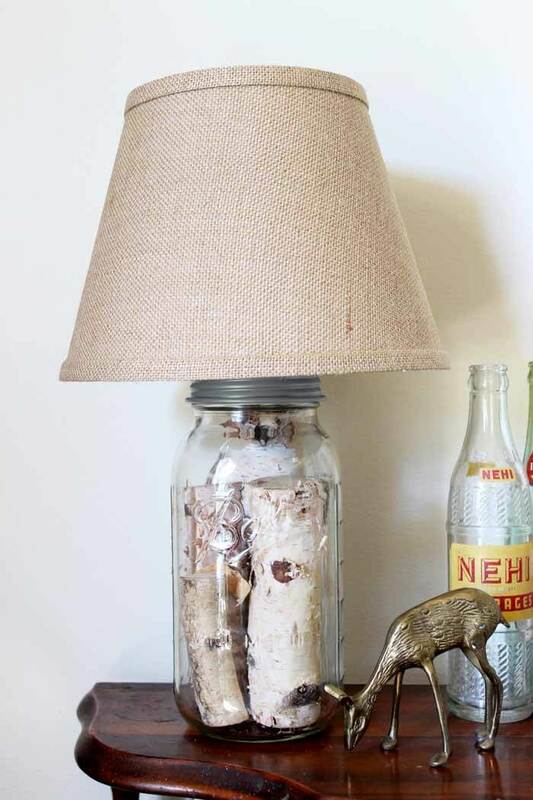 If you are looking for a way to put a shade on your lamps, mason jars are an easy way to do it. If you want to give your garden a small makeover and want to incorporate something aesthetically pleasing and earthy, these hanging lamps are the way to do it. The mason jars are filled with pebbles and small rocks to make it seem more earthy, while the tea light brings in the illumination that one needs. If you want a string of lights to cover a certain part of your home, making a mason jar garland out of smaller mason jars is a good and easy way to do it. 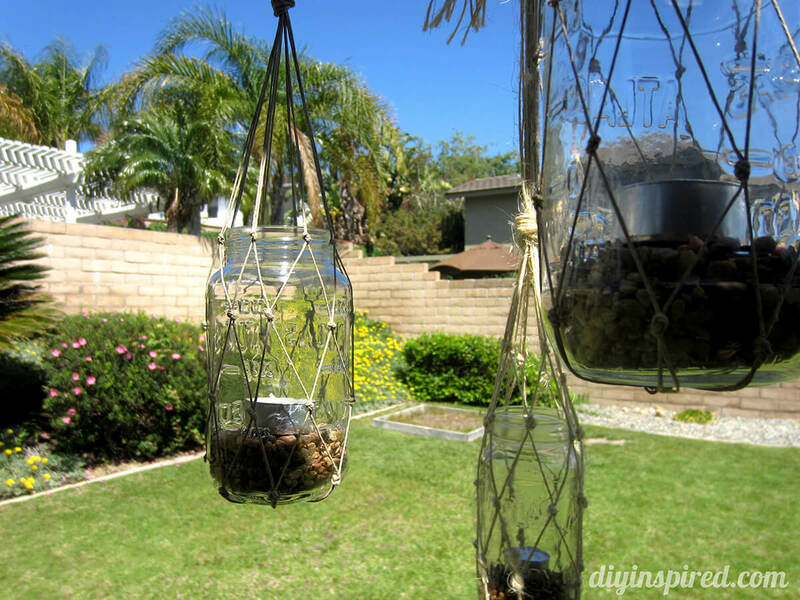 The mason jars need to be properly tied with a strong rope to hold them up properly.